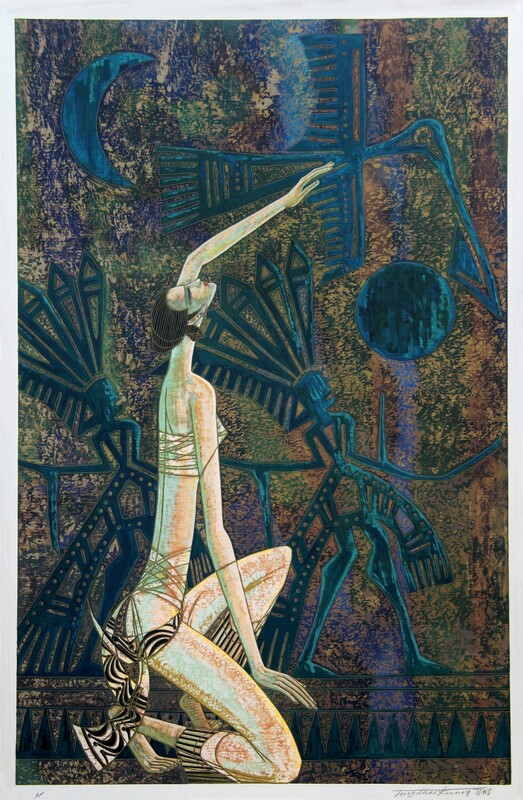 “Silk Road” by Ting Shao Kuang, serigraph on silk, 1987. Source: Assini-Thomson Collection. Influenced by the art and literature of the greats, the legendary Chinese-born, now United States-resident painter Ting Shao Kuang has carved his own path and is one of the most celebrated Chinese painters today. Ting’s artistic style and what it represents - a unique, harmonious blend of traditional Eastern and 20th century Western influences – has earned him an endless string of accolades, worldwide recognition withh is works appearing in collections across the glog, and stellar auction prices. Like many Eastern artists of his generation, Ting Shao Kuang began his life under the shadow of military conflict - namely the Second Sino-Japanese War that almost entirely laid to waste the village of Chenggu in the northern province of Shaanxi, where he was born in 1939. The evacuation of Ting's parents to Taiwan when he was nine left him abandoned and lonely, but it also accelerated his early development as an artist. Within a few years, he was painting every day, his scant supplies forcing him to use cooking oil as a pigment medium. But it wasn't just the youngster's sheer resourcefulness that impressed observers - it was also his talent, which led to his admission to the prestigious Central Academy of Arts in Beijing in 1957. While the teachings at the school centred on Socialist Realism, Ting derived more inspiration from his discovery of Western artistic greats such as Picasso, Modigliani and Matisse. Such continued restrictions did not prevent Ting maintaining a highly active practice during this tricky period, spending extensive time in Kunming in the beautiful Yunnan province and being appointed to teach at the Yunnan Art Institute - a position that he held until 1980. The artist was certainly forced to watch his back during this time - at one point having to evade capture by fleeing to the monasteries of northern China - but even in these straitened circumstances, he continued to find inspiration, including from the centuries-old preserved cave paintings on the old Silk Route. On his return to Kunming in 1968, the artist maintained a low profile until Mao's death in 1976, at which point, he and his colleagues quickly got to work on making up for lost time, including with their foundation of the Yunnan Shen She Art Association at the end of the 1970s. As if to cap a seemingly astonishing turnaround in his home country, Ting even received a commission to paint a mural in the Great Hall of the People in Beijing. Otherwise, though, Ting's mind was largely on securing his long yearned-for complete artistic freedom, which he finally achieved by moving to the US at the onset of the 1980s. To say that Ting's migration had the desired impact on his career would be something of an understatement - within just three years of the move, he had more than 30 personal university and museum-based exhibitions to his name and began to exert his strong, Yunnan influence on the burgeoning American modern art scene. The years since have proved extremely busy for Ting. 1983 saw him win a gold prize in an art competition hosted by the University of Southern California (USC) in commemoration of Martin Luther King, while in 1989, he held a one-man show at Tokyo's Art Museum Ginza. In 1991, his work White Night was sold for HK$2.2 million at a Christie's auction in Hong Kong, representing the highest price ever paid for a contemporary Chinese painting. But for all of the awards and honours that have continued to roll in for Ting Shao Kuang, it is his continued contributions of remarkable distinction to the world of fine art - in particular, the Heavy Color/Yunnan Art School/Yunnan School style - by which he is most sure to be remembered in history by Chinese and international admirers, students and collectors alike. “Dawn of the Yunnan School” by Ting Shao Kuang, serigraph on paper, 1991. Source: Assini-Thomson Collection.